Mansions, fancy cars, and private jets have always been must have status symbols for the super rich. Now you can add mega yachts to that list. And for their elite owners, bigger is always better. Bigger–as in 590 feet or nearly the size of two football fields. That’s the length of the world’s largest private yacht, the Azzam. Built by the German shipbuilding company, Lurssen, the Azzam will be one of the fastest boats on the planet when it officially launches this fall. Its owner isn’t known, but it will reportedly be delivered to a member of the United Arab Emirate’s royal family when it’s completed. Insiders have estimated that the ship cost at least half a billion dollars to build, and that’s just for the structure. By the time the very last doorknob is in place, Azzam’s price tag could climb to $1 billion dollars. According to de Waard, the demand for larger yachts (we’re talking 100 feet and above) has declined over the past five years. But, the market for super-yachts – 500 feet or more – has actually continued to grow. 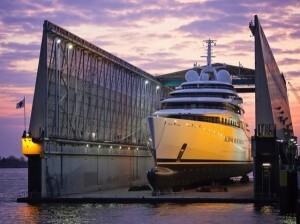 Four out of the five world’s largest yachts have been delivered in the past five years. Along with the established markets in the U.S., Russia, and the Middle East, the super-rich in South America and Asia are slowly buying into the trend. And, despite a shaky world economy, there’s no sign that the battle of the super-yachts will slow down any time soon. de Waard says there are at least 15 yachts almost 330 feet long under construction. Price tag starts at $200,000,000. Yacht Direct is committed to offering and managing all aspects of your yacht purchase or charter. Copyright © 2019 YachtDirect, Inc.